Link building is hard. Get over it. - Edit. Link building is hard. Get over it. The SEO industry seems to have a desperate need to constantly reinvent and relabel everything, probably due to the reputational issues it has faced in the past and partly in an attempt to be taken seriously in broader marketing circles. 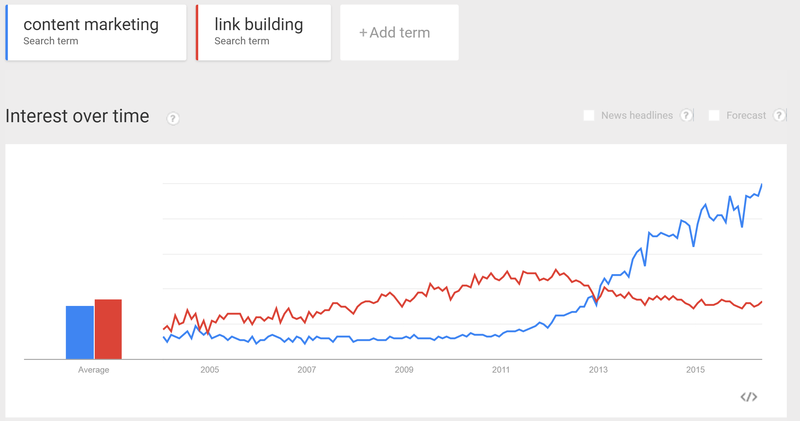 SEO became inbound, link building became link bait and more recently Content marketing is the new link building. This is where I want to pick things up, but first let me just clarify my position. Content marketing has been around forever; it serves far more purposes than simply acquiring links. Engagement, conversion, advocacy are all objectives that spring to mind when discussing content marketing and all actually help to generate more visibility and traffic through search. However, there has been an explosion in businesses looking for Content marketing services since 2012. From the 30 – 40 leads we receive weekly, nearly 50% mention it, but here’s the thing: although they ask for Content marketing their aim is clear – more links, higher rankings, more traffic and more sales through search. This doesn’t mean Content marketing is link building, it simply means that a lot of people looking for Content marketing are really wanting links. In 2012 the first version of Penguin rolled out and link building became a swear word never to be uttered again. In fact, a lot of people in the industry will frown upon anyone who even utters the words ‘link building’ and write them off as being stuck in the past. There is a massive problem with this: YOU STILL NEED LINKS TO RANK. Now don’t get me wrong, I’m an advocate of broadening your strategy, looking at Content marketing from a wider perspective, investing in UX and ensuring you’re optimising for intention not just sales. However, good authoritative links are still crucial in securing more search visibility and traffic. There are multiple studies that show the impact links have on rankings, all of which confirm the importance of links to your overall search visibility. So we have a dilemma, right? Actually, we have a couple. Personally I don’t have an issue with referring to it as ‘PR’, ‘Content marketing’ or ‘Blogger outreach’, as long as we’re clear that the key objectives are to acquire links, and aware of the importance of links in delivering rankings. If we’re not clear on this it misleads the industry into thinking that links aren’t important. Consequently, results don’t get delivered and it actually harms the reputation of SEO. Of course, there are more benefits to great PR, Content marketing and Outreach, but if the objective is links then let’s just be honest about it and not dress it up as something else. After Penguin, manual penalties and all the other link-based updates meant that low-quality links became extremely risky. You can no longer go out there and simply buy links, or rely on a shady link network you pay $100 a month for, or even one your agency built up that “Google has no way of detecting”. Link building got hard. Even though the industry had been preaching great content and link bait for years, the truth is that paid and manipulated links were delivering the results. Now we had to take content seriously, we had to actually speak to people, like on the phone! We might actually have to meet bloggers and journalists, face–to-face! Woah. Many agencies came to a swift realisation that link building was too hard. As well as being difficult, building good links became expensive. You now need to do a lot more than write a 400-word article and transfer $50 via PayPal. What did the industry do? Well, some simply went out of business. The entire business model was based on delivering low-quality links and transformation was too difficult. Some agencies toughed it out and worked with clients to figure out the new landscape. It involved a lot of testing, managing expectations and actually having to live by the “quality over quantity rule”. They did this until they got to a point where they had figured out how to deliver links that were genuinely earned and not paid for or manipulated. But this is where I have a bit of a problem: there was another approach and that was to change the goal posts. Now let me be clear, I’ve spoken and written many times about focusing on other things outside of links, however I have always maintained the importance of links as part of an SEO strategy. This isn’t where I take issue. If your Content marketing, PR or whatever strategy you use is designed to deliver links, then that’s exactly what it should do. As an industry we shouldn’t be saying, “look, we didn’t deliver the links but look how helpful this content is for users”. It may well be helpful, it may well have tons of added value, but if it was invested in to deliver links, then that’s what it should do. If a client is ‘fixated on links’ it’s probably because that’s what they’re paying you to deliver. There is nothing wrong with that. To make it clear: if you’re investing in Content marketing to acquire links then you should expect links to be delivered. Yes, it will hopefully drive traffic, be shared socially, help convert, raise awareness and be genuinely fun, interesting or useful. But let’s not use these things to disguise the fact it didn’t deliver on a key objective – links. ‘Link metrics you should be using’ and ‘Engagement Rate Optimisation’. As an industry we just need to be more honest. Links are still important and you won’t rank without them, but they are difficult to get and it is no longer a numbers game. Content marketing and digital PR are in my opinion the best strategy for link acquisition. It’s not easy but that doesn’t mean we should dismiss links and distract clients from their value.